Range map of Chinchilla species. Red dots = Last known families (Ch. lanigera). Chinchilla is the common name and genus name for squirrel-sized South American rodents of the Andes mountains, characterized by thick, soft fur, a bushy tail, a broad head, four-toed feet on the short forelimbs and long hindlimbs, and a somewhat rabbit-like appearance. There are two extant species in the Chinchilla genus, Chinchilla brevicaudata (short-tailed chinchilla) and Chinchilla lanigera (long-tailed chinchilla). Chinchillas are closely related to the viscachas of the same family, Chinchillidae. Once very abundant, chinchillas have been hunted nearly to extinction in the wild, valued for their very fine-textured, soft, and dense fur. Gregarious and either nocturnally active or crepuscular, wild chinchillas largely live in colonies in rocky areas of the Andes region of Bolivia and Chile, with some extension believed to remain into southern Peru and northwestern Argentina (Honeycutt 2004; Cortés et al. 2003). While they are now bred on farms for their fur, the wild populations remain very much at risk. In particular, C. brevicaudata is critically endangered. Populations of C. lanigera remain important in their now limited ecosystems in the high Andes. In addition to their value for furs and as pets, because of the chinchilla's small size, long life span (12 to 20 years in domestic situations), and various similarities to humans, it is a common animal for experimental research. For example, the chinchilla has similar middle ear anatomy and nervous system connections as humans, and its range of hearing (20 Hz to 30 kHz) is close to that of a human, and the chinchilla cochlea is fairly easy to access; for this reason, it is often used as an animal model in researching the auditory system (PIR). It also has been used to develop a vaccine for cholera. 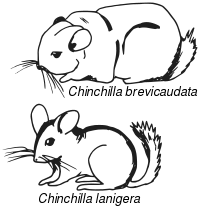 Other medical research fields in which chinchilla is used as an animal model include study of Chagas disease, gastrointestinal diseases, pneumonia, and listeriosis, as well as of Yersinia and Pseudomonas infections. Chincillas belong to the rodent family Chinchillidae with viscachas and their fossil relatives. All members of Chinchillidae are large-bodied animals with broad heads, large eyes, thick and soft fur, well-developed hind limbs that are longer than the forelimbs, bushy tails, and forefeet with four toes (Myers 2000; Honeycutt 2004). They range in size from the chinchillas, which can be less than 1 kilogram (2.2 pounds) to the plains viscacha (Lagostomus maximus) which can weigh up to 3 kilograms (6.6 pounds). They are restricted to southern and western South America, from Peru to Patagonia, often in association with the Andes, although the plains viscacha occurs at lower elevations in areas of southern Paraguay and northern Argentina (Honeycutt 2004). 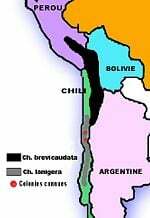 There are three extant genera of Chinchillidae currently recognized: Chinchilla (chinchillas), Lagidium (mountain viscachas), and Lagostomus (plains viscachas), with three species in Lagidium, two in Chinchilla, and one in Lagostomus (Honeycutt 2004; ITIS 2001a, 2001b). Chinchillas have four toes on the hind feet, with weakly developed hind claws, like the members of Lagidium, and unlike the three toes, with strong hind claws, of the strong-digging members of Lagostomus (Myers 2000). Chinchillas have very large auditory bulllae relative to the other two genera. There is little noticeable difference between two living species of chinchilla, Chinchilla brevicaudata and Chinchilla lanigera, other than the fact that C. brevicaudata(short-tailed chinchilla) has a relatively shorter tail and ears, and a thicker neck and shoulders, than C. lanigera (long-tailed chinchilla). The long-tailed chinchilla has a body length of up to 26 centimeters (10 inches), with a tail length of about 13 centimeters (5.1 inches), while the short-tailed chinchilla ranges to about 30 to 33 centimeters (12 to 13 inches), with a tail length of about 10 centimeters (3.9 inches). While domestic animals tend to be more sexually dimorphic than wild species, with the female weighing up to 800 grams (28 ounces) and the male up to 600 grams (21 ounces), it is less so in the wild. Males of wild long-tailed chinchillas have been measured to weigh about 369–493 grams (13.0–17.4 ounces), with a mean of 412 grams (14.5 ounces) and females weigh 379–450 grams (13.4 to 15.9 ounces) with a mean of 422 grams (14.9 ounces) (Spotorno et al. 2004). The long-tailed chinchilla (Chinchilla lanigera) also is called the Chilean, coastal, or lesser chinchilla and is found in mountainous regions of Chile. The short-tailed chinchilla (Chinchilla brevicaudata) is also called the Bolivian, Peruvian, and royal chinchilla, and has a historic range that includes the Andes of southern Bolivia, southern Peru, northwestern Argentina, and northern Chile (Honeycutt 2004). The long-tailed chinchilla has healthier population numbers, although it still is listed as Vulnerable by the IUCN, with a high risk of extinction. The short-tailed chinchilla is critically endangered. All neonates are precocial, fully furred, with erupted teeth, open eyes, and able to walk within an hour after birth. The fur is remarkably dense, and has been said to have more hair per square inch than any other known mammal (AW 2008). The hair of the long-tailed chinchilla is about 2 to 4 centimeters (0.79–1.6 inches) long, with gray, white, and black bands; it is silky, extremely soft, and firmly adhered to the skin (Bennett 1835). Up to 75 wool hairs, 5 to 11 millimeters (0.20–0.43 inches) in diameter, emerge together from a single skin pore. Vibrissae are abundant, strong, long (100–130 millimeters or 3.9 to 5.1 inches), and emerge from single follicles (Wilcox 1950). General color of upper parts is bluish or silvery gray, underparts are yellowish white. The tail has long, coarse, gray and black hairs on its dorsal surface that are 30 to 40 millimeters (1.2–1.6 inches) long near the body, 50 to 60 millimeters (2.0–2.4 inches) long near the tip, and form a bristly tuft that exceeds vertebrae by 50 millimeters (2.0 inches) (Bennett 1835). Andean Chinchilla habitat in Chile. In their native habitat, chinchillas prefer high elevations from 3,000 to 5,000 meters (9,840 to 16,400 feet) and live in burrows or crevices in rocks (Honeycutt 2004). 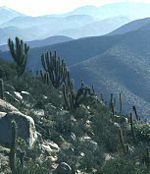 The natural habitat of Chinchilla lanigera is barren, arid, and rugged areas of transverse mountain chains in north-central Chile that connect the coastal mountain ranges to the Andes. Climate is rather harsh with summer temperatures climbing during the day to up to 30°C in shade and dropping to 7°C at night (or below freezing point in winter). Typically, habitat is rocky or sandy with a sparse cover of thorn shrubs, few herbs and forbs, scattered cacti, and patches of succulent bromeliads toward the coast. Chinchillas are agile jumpers and can jump very high, up to 1.5 meters (5 feet). The long-tailed chinchilla is either nocturnal or crepuscular, and the short-tailed chinchilla is listed as nocturnal (Honeycutt 2004). Both species form colonies and are highly vocal, with females displaying high levels of aggression and apparently dominant (Honeycutt 2004). Colonies can be from a few individuals to over 100 individuals, and even several hundred organized into smaller subgroups (Honeycutt 2004), which may spread over a 100 hectare area. Population density is 4 to 5 individuals per hectare. Population size does not fluctuate between years of low and high rainfall. Chinchillas are predominantly herbivorous, feeding on grasses and seeds, but also will eat insects (Honeycutt 2004). Wild Chilean chinchillas feed on up to 24 plant species, mainly herbs and grasses. Diet changes between sites both seasonally and across years. They consume succulents in summer and appear to drink no water in the wild. Predators in the wild include hawks, skunks, felines, and canines. Culpeo foxes (Pseudalopex culpaeus) take both adults and juveniles, while Magellan-horned owls (Bubo magellanicus) prey mainly on juveniles (Spotorno et al. 2004). Chinchillas can breed any time of the year. At 111 days, they have a very long gestation period compared to other rodents. The animal (whose name literally means "little Chincha") is named after the Chincha people of the Andes, who wore its soft and dense fur (Davidson 2008). The first literature reference to chinchillas dates back to 1599, in a book published in Seville, entitled Historia Natural y Moral de las Indias, written by Father José de Acosta (from Spain): "About mountain animals. Chinchillas are another type of small animals such as squirrels. They have a fur (coat) that is of wonderful softness" (Bickel 1987). The international trade in chinchilla fur goes back to the sixteenth century. The fur from chinchillas is popular in the fur trade due to its extremely soft feel, because of the density of hairs sprouting from each hair follicle. The color is usually very even which makes it ideal for small garments or lining of large garments, though some large garments can be made entirely from the fur. The pelt of a chinchilla is relatively small, so many animals must be killed to make a single coat. Though wild chinchillas are no longer hunted for their fur, domestic chinchillas are still bred for this use. One of the first people to think of breeding chinchillas for profit was the Jesuit priest Juan Ignacio Molina, who was also the first person to provide an accurate description of chinchilla, in 1810. There were repeated attempts to breed these animals in captivity. The first reliable report of successful breeding attempt in captivity comes from Frederico Albert (1900), who was director of the zoological and botanical research station at Santiago, Chile. He reported, in his article "La Chinchilla," about a certain Francisco Irrazaval in Santiago who had received a pair of chinchillas (presumably Chinchilla lanigera) in 1895. The first chinchilla was born that same year and the pair continued to produce 2 litters a year until the outbreak of an epidemic during the summer of 1896 ruined this excellent breeding success, and all the animals, 13 at that time, died within a period of two months (Bickel 1987). Mathias F. Chapman, a mining engineer from California, was working in Chile in 1918, when he purchased a chinchilla as a pet and took a liking to it. He envisioned raising a whole herd of chinchillas and he applied to the Chilean government for permission to capture and transport several animals to the United States. At this point, chinchillas were already close to extinction from humans killing them for the fur trade. The Chilean government was reluctant to grant trapping permission, but Chapman persisted, and eventually the government allowed him to catch them (Barnes 2002). Chapman and a group of men searched the mountain for three years and caught only eleven chinchillas. He then took the 12,000 foot (3,700 meter) climb down over a period of twelve months so the chinchillas could acclimate to the changing environment. He then brought the eleven wild chinchillas he had captured to the United States for breeding, where he started the first chinchilla farm. Only three of these chinchillas were female. This was the beginning of the domestic chinchilla. Since the mid-1960s, chinchillas have become increasingly popular as house pets. Only the long-tailed chinchilla has been bred in captivity (AWI 1983). Chinchillas were once so abundant that early explorers reported seeing hundreds in a single day (AWI 1983). However, the commercial harvesting of both species was extensive. An estimated two million pelts were exported between 1895 and 1900, and in 1905 alone there were records of 217,836 pelts imported to the United States alone (AWI 1983). As they became rarer, the price for the furs increased, and the animals were hunted even more relentlessly. By the early twentieth century, both populations had collapsed (AWI 1983). Because of the impending extinction of short-tailed chinchillas, conservation measures began to be implemented in the 1890s, in Chile. However, these measures were unregulated. In 1910, a treaty was signed between Chile, Bolivia, Argentina, and Peru, bringing the first international efforts to ban hunting and commercialization of chinchillas. Unfortunately, this effort also led to a great price increase for the furs and thus a further decline of the remaining populations. The first successful protection law passed in Chile was not until 1929. The Chilean chinchilla (long-tailed chinchilla)is considered endangered by Chile (Vulnerable by IUCN), with Cofré and Marquet (1999) assigning them the second highest conservation priority among Chilean mammals. As a result of overharvesting for its fur, the entire species was almost extirpated during early 1900s. Despite the protection provided by the agreement signed between governments of Argentina, Bolivia, Chile, and Peru, and under Chilean law since 1929, poaching continued. By the 1950s, the Chilean chinchilla was considered extinct. Wild populations were rediscovered in 1978, and in 1983, Reserva Nacional Las Chinchillas was created in Chile. This reserve comprises 4,227 hectares, of which 556 hectares had colonies before 1983, but only 264 hectares had colonies in 1989. The former distribution has been reduced primarily to only 2 areas. Only 19 of 42 known colonies in Reserva Nacional Las Chinchillas currently are protected. The total wild population is estimated as 2,500 to 11,700 individuals and is declining, as indicated by reduction in area covered by present colonies and their fragmentation. Although protected inside the reserve from human activities since 1987, population size continues to decline. A conservation plan has been in place since 1990, but as of 2004, there has been no particular conservation action being taken for the small, genetically rich northern population of La Higuera, in Chile (Spotorno et al. 2004). Ranched chinchilla pelts are considered superior to wild ones, and thus the demand for wild pelts has collapsed, although hunting (poaching) still continues (AWI 2004). Domestic chinchillas can be kept as pets. Chinchillas are crepuscular or nocturnal and typically do not like to be disturbed during the day, which may make them less favorable as pets to some people. Chinchillas are naturally very skittish creatures and generally do not like to be held, although they can become very attached to their owners if they grow up without a cage mate. Because of their high-strung disposition, they are not usually considered to be good pets for small children. However, chinchillas can be very friendly animals if sufficiently acclimated to human touch as kits, making them good pets for patient owners. Animal Welfare Institute (AWI). 1983. Trade. Chinchillas. Animal Welfare Institute. Retrieved August 22, 2008. Animal-World (AW). 2008. Chinchillas. Animal-World. Retrieved August 22, 2008. Barnes, S. 2002. Chinchilla history. Mutation Chinchilla Breeders Association. Retrieved August 21, 2008. Bennett, E. T. 1835. On the Chinchillidae, a family of herbivorous Rodentia, and on a new genus referrible [sic] to it. Transactions of the Zoological Society of London 1: 35–64. Bickel, E. 1987. Chinchilla Handbook. Neptune City, NJ: T. F. H. Publications. ISBN 0866224947. Cofré, H., and P. A. Marquet. 1999. Conservation status, rarity, and geographic priorities for conservation of Chilean mammals: An assessment. Biological Conservation 88: 53-68. Retrieved August 21, 2008. Cortés, A., C. Tiradoa, and M. Rosenmann. 2003. Energy metabolism and thermoregulation in Chinchilla brevicaudata. Journal of Thermal Biology 28(6-7): 489-495. Retrieved August 21, 2008. Davidson, C. 2008. What is a chinchilla? Davidson Chinchillas. Retrieved August 21, 2008. Honeycutt, R. L. 2004. Viscachas and chinchillas. Pages 377 to 384 in B. Grzimek, D. G. Kleiman, V. Geist, and M. C. McDade (eds. ), Grzimek's Animal Life Encyclopedia, volume 16. Detroit: Thomson-Gale. ISBN 0787657921. Integrated Taxonomic Information System (ITIS). 2001a. Chinchillidae Bennett, 1833. ITIS Taxonomic Serial No. : 584574. Retrieved August 20, 2008. Integrated Taxonomic Information System (ITIS). 2001b. Chinchilla Bennett, 1829. ITIS Taxonomic Serial No. : 584613. Retrieved August 20, 2008. Myers, P. 2000. Chinchillidae. Animal Diversity Web. Retrieved August 20, 2008. Partners in Research (PIR). Chinchilla. PIRweb. Retrieved August 21, 2008. Spotorno, A. E., C. A. Zuleta, J. P. Valladares, A. L. Deane, and J. E. Jiménez. 2004. Chinchilla laniger. Mammalian Species 758: 1–9. Retrieved August 21, 2008. Wilcox, H. N. 1950. Histology of the skin and hair of the adult chinchilla. Anatomical Record 108: 385–397. PMID 14799877.